Mobile Medical Repair has been providing quality medical equipment service and repair to hospitals, LTACs, nursing homes, EMS, air and ground transport, fire departments, police departments and home medical equipment companies since 2003. Using only factory-authorized parts, our factory-trained and certified technicians have serviced more than 15,000 ventilators in the United States, Canada and South America. To avoid high shipping costs as well as the risk of loss or damage in transport, most of our services are performed on-site at your facility, ensuring the most timely service in the industry. Mobile Medical Repair is owned by married couple Dominick McCann and Angela King, and also Daniel McCann (Dominick’s brother). Dominick and Daniel are both military veterans. The team has provided extensive consulting to ventilator manufacturers on product design, clinical application, service and maintenance logistics. Angela has lectured on various facets of mechanical ventilation in 30 countries. We have served customers in all of the shaded states. 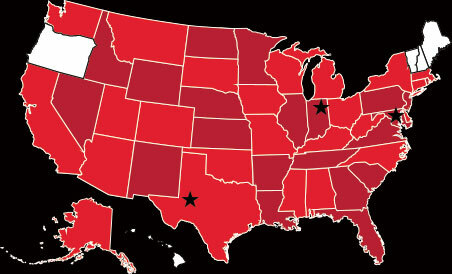 Stars indicate our Service Centers.